At first glance it looks like the cake is decorated with icing ribbons between the tiers, but look closely. Those are rose petals arranged as a ribbon. It’s pure floral genius! The petals used on this cake are pastels – which would be lovely for a spring or summer wedding. But think about how stunning this would be with deep red roses (or even black magic roses) – especially for a winter wedding. 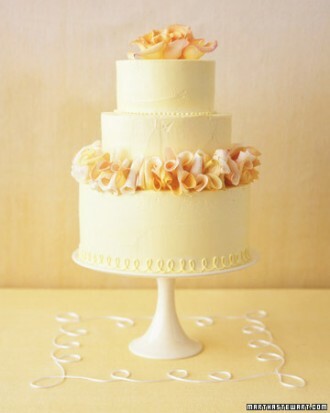 The icing on this cake is a very light yellow which works perfectly with the pastel petals. A shocking white icing would work best with deep red petals. We found this lovely cake here.